Growing up is not made for the weak. Between the bills, the growing and failing relationships, high career expectations, strengthening our selfie arm and day dreaming about college, it's no surprise that we sometimes act like a lost puppy dog whimpering for our mommy. Bills. They are going to come – every single month and the dollar amount next to the “balance due” box is not going to magically evaporate into thin air. Pay them. Pay them on time. Once the sickening feeling in your stomach passes then take a second to pat yourself on the back because I don’t know about you but I gain a high knowing that my hard work is what has created a life of my very own. Wardrobe. You are not 16 years old anymore. Your body has changed. Your environment has changed. As much as I would love to pat you on the back for swapping out your booty showing dresses and old t-shirts I’m not going to because that is exactly what you should be doing. I had a boss that told me, “Treat every day as an audition. Dress the part.” You never know who you are going to run into. The ex that shattered your heart? Oh you’re going to tell me you want to run into him at the coffee shop looking like a straight up hot mess? Yeah, I didn’t think so. How about, coincidentally shaking hands with someone who has the power to get you the interview you have been dreaming about. If you think your cleavage baring top is making an impression well, it is, just not the right one. This doesn’t mean you need to scamper around town in a ball gown but take the extra time in the morning to appropriately pull yourself together – you won’t regret it. Relationships. If there is not 100% effort coming from both ends then you need to put those feet of yours to work and walk away. No excuses. I hate to pull the "we are too old" card but mind games should not be played at this age. If your lover does not look at you as if you may be magic, deuces. Have fun. Date around. 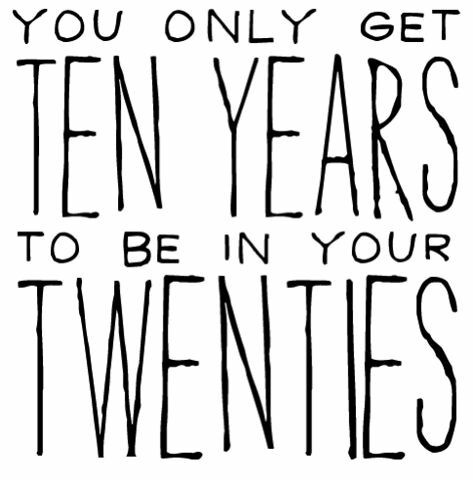 That is what our twenties are for, abso-fricken-lutely, however don’t ever settle. Carbs. Remember the days where you could eat pizza and fries for 2 out of 3 meals a day and you were still able to slide right into your size 0 jeans? HA. What I would do to have that teenage metabolism back. Now I daydream about bagels as if they were David Beckham. Is watching what I put into my body always fun? Not even close. But lets face it guys, we get one body and one body only so the least we could do is take care of it. I’m not saying life is constantly rainbows and sunshine but I am all for embracing the twist and turns that are thrown our way during our twenties. Maybe I am constantly lying to myself but I firmly believe that each passing day is another chance to figure it out. During the times when I truly feel confused about life, I hear my moms voice in my head, “ Chel, your twenties are such a cool time in your life. You grow. You learn. You mold into the person that you want to become and weed out those people and things that no longer serve you. Don’t be so hard on yourself, it will all fall into place.” I have to say, she has a point. I am five years into this crazy time of life and I couldn’t agree with her more. We only get 10 years of this chapter, why not make the best of it?